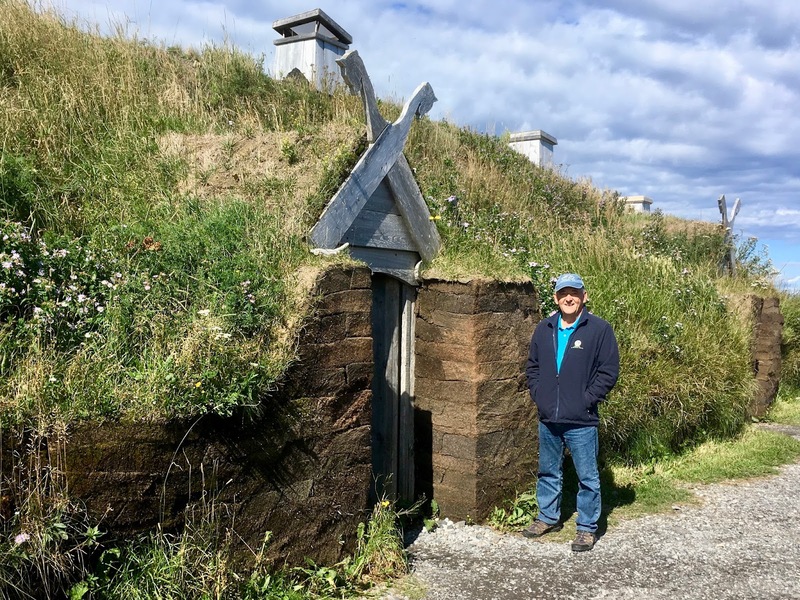 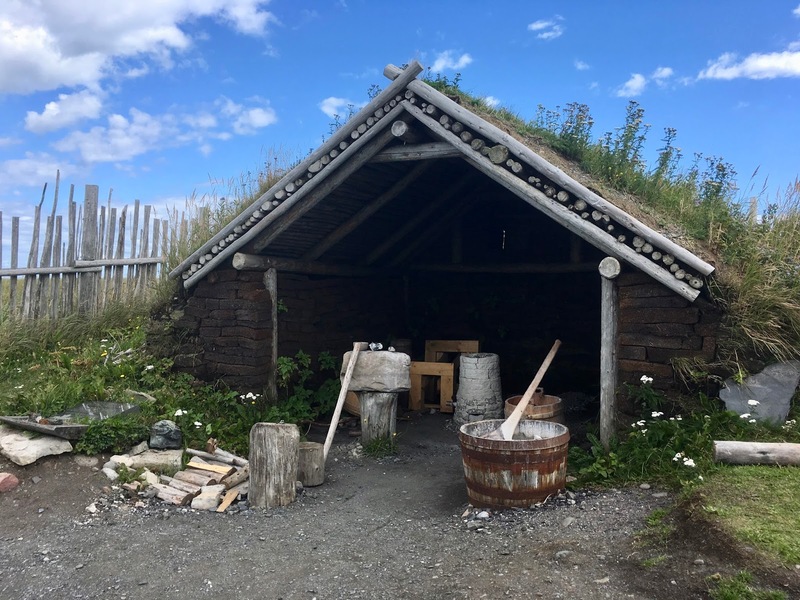 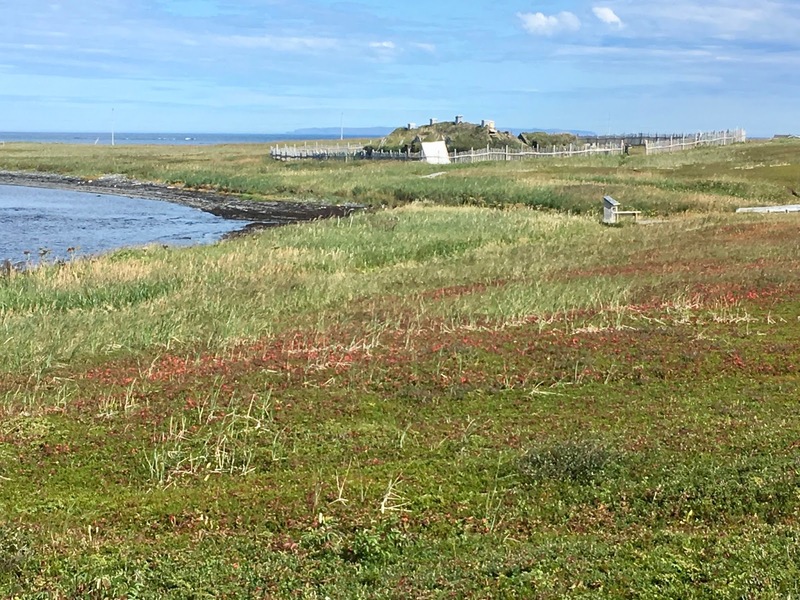 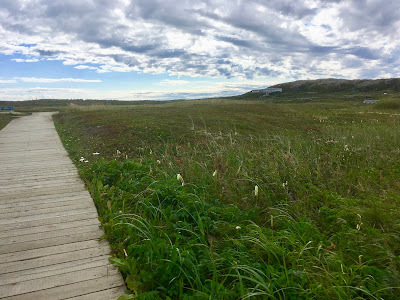 They built timber and sod buildings at L'Anse aux Meadows and according to the Sagas of Icelanders stayed for two to three years, returning to Greenland after hostilities broke out with the native population. 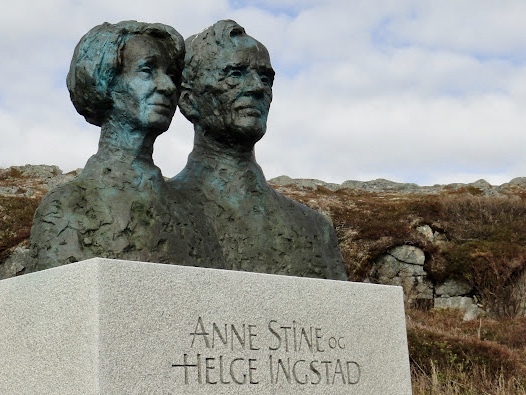 It was here in the 1960s that Norwegian Helge Ingstad and his archaeologist wife, Anne Stone, first discovered evidence of the Norse explorers. 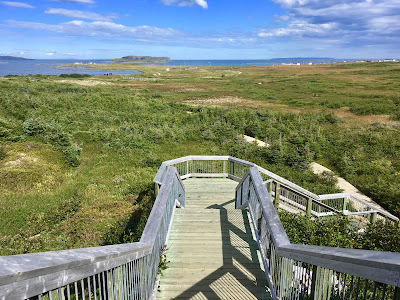 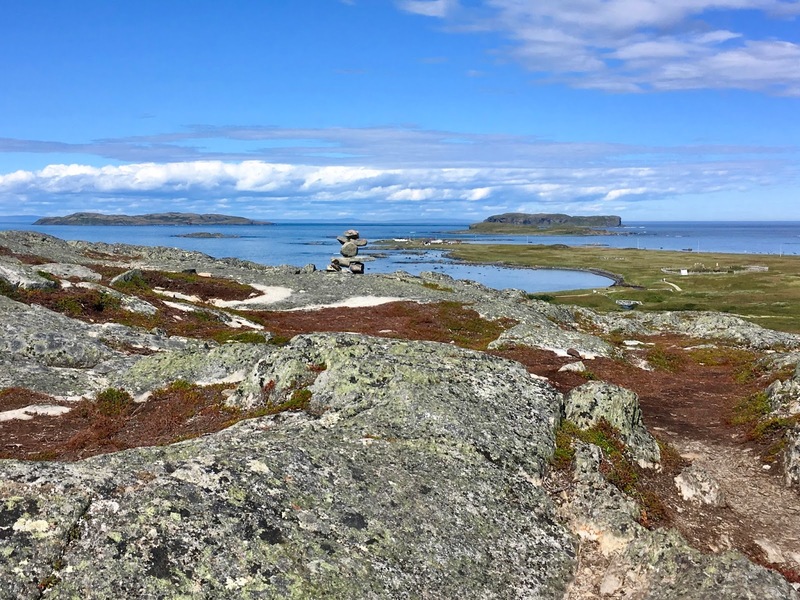 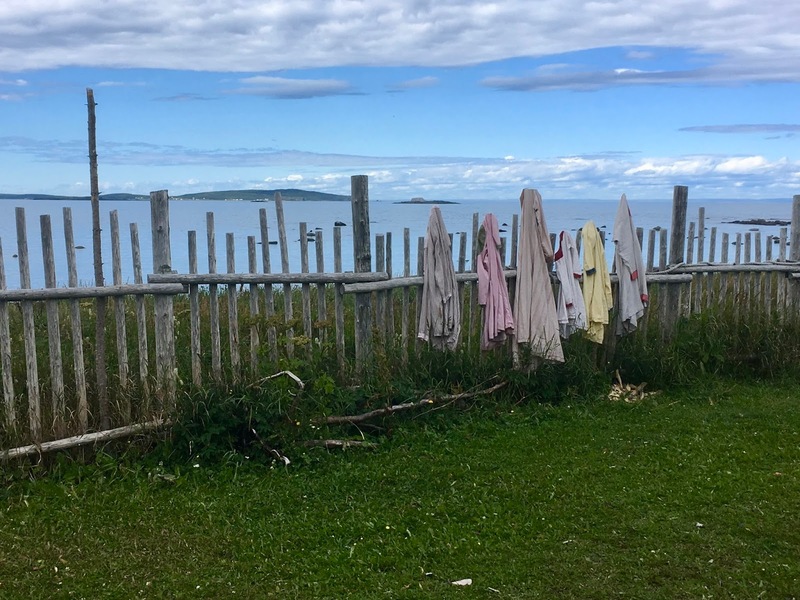 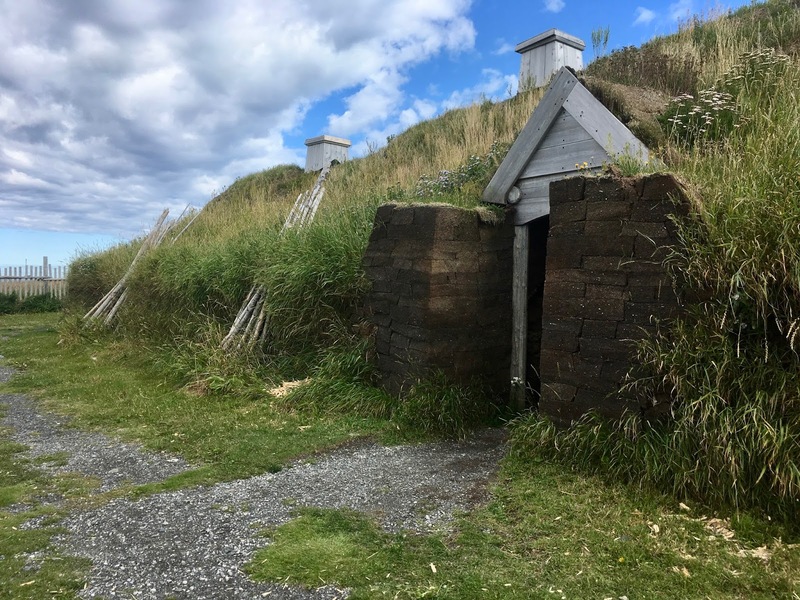 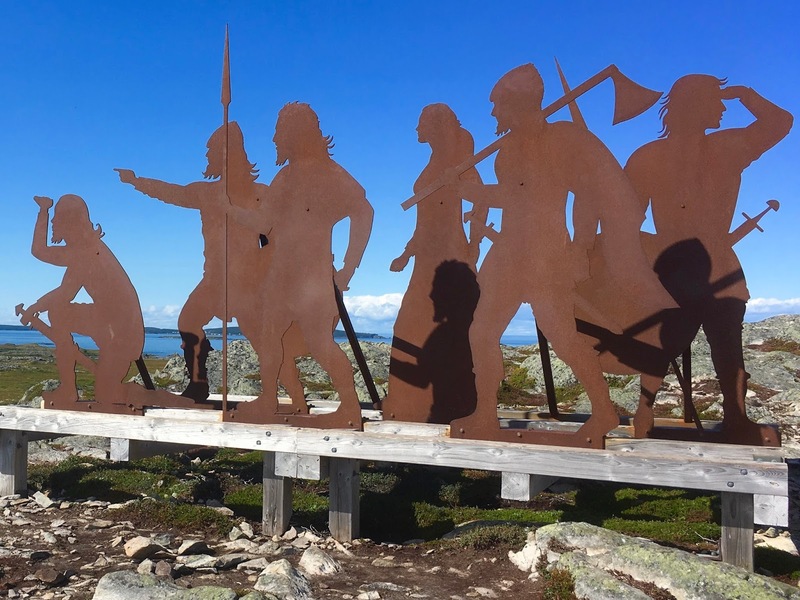 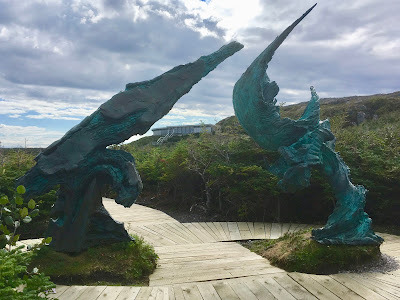 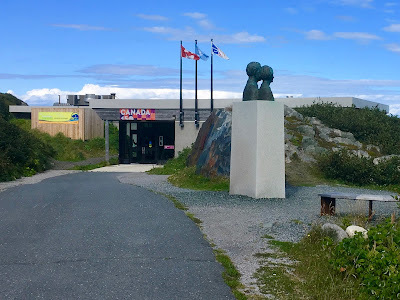 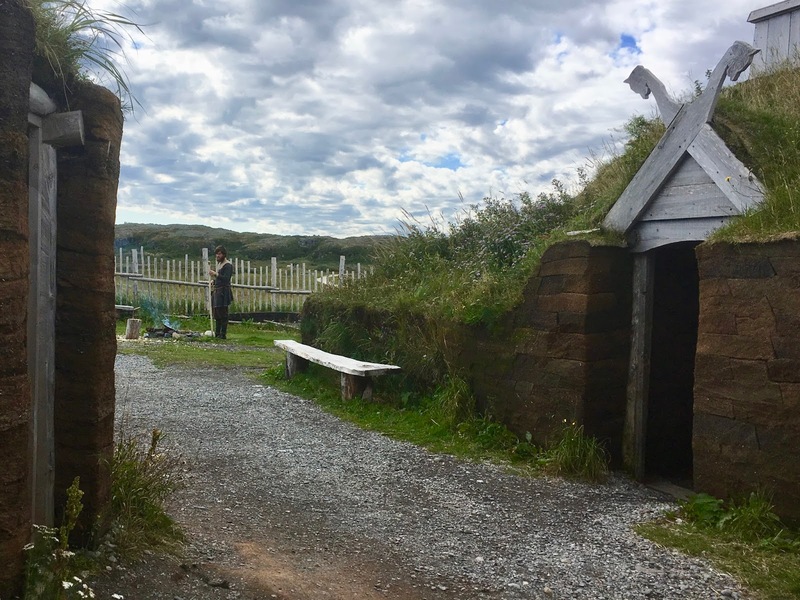 The L'Anse aux Meadows National Historic Site tells both stories - of the Norse settlements and of the archaeological digs. 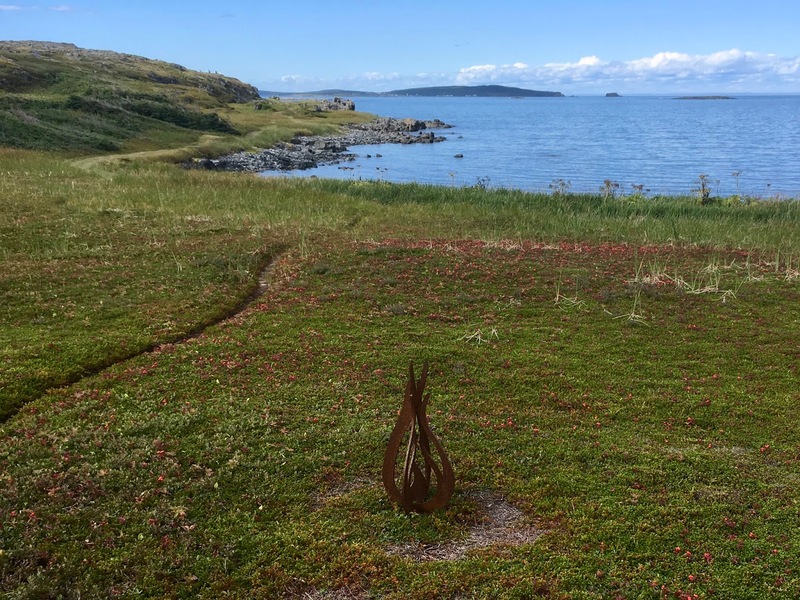 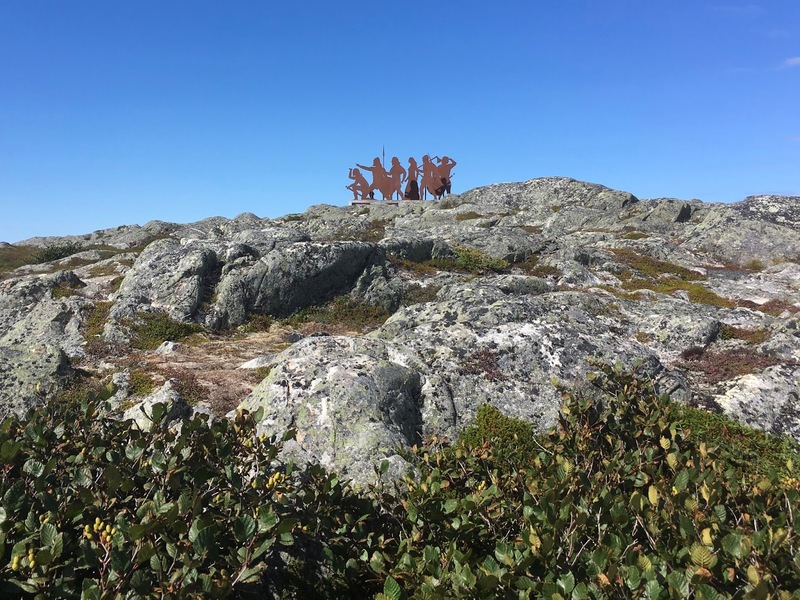 This sculpture, created with corten steel, is by New Brunswick artist Karen Van Niekerk. 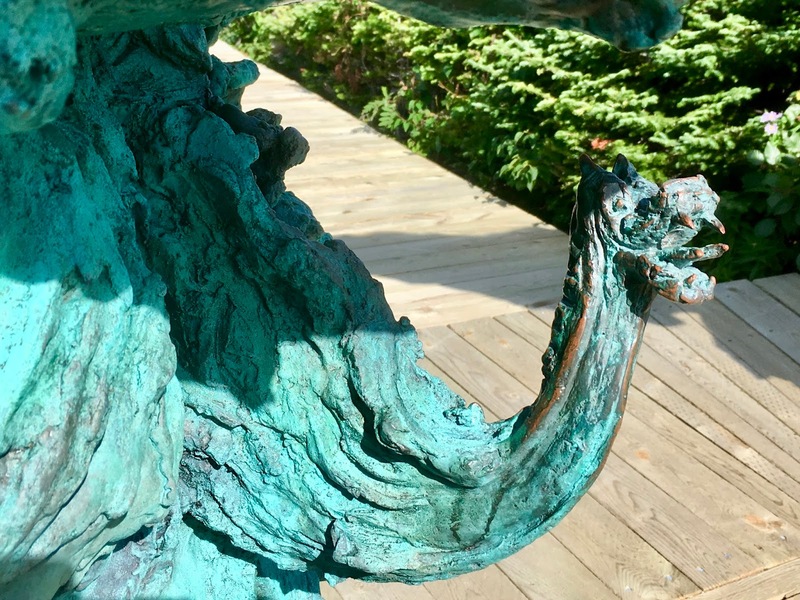 If one looks closely there is a detail of a dragon, obviously paying homage to those that once adorned Viking longboats. The boardwalks and paths to the Norse settlement are clearly marked, yet allow visitors to veer off and explore on their own. 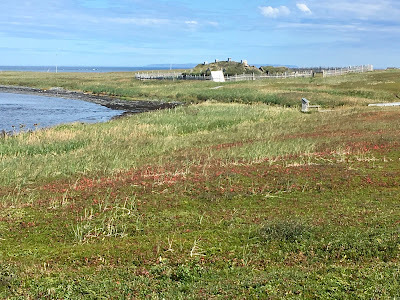 The buildings blend into the landscape. 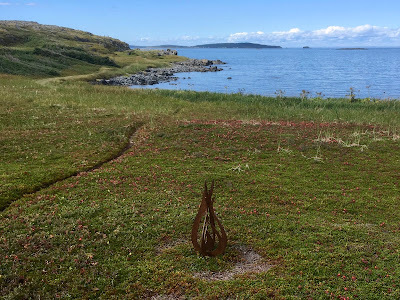 Campfires, the remains of those lit a thousand years ago, are still visible to the eye. The size of the Viking settlement is impressive and yet unassuming at the same time. It would have been home to about twenty people. The costumed Viking interpreters were a great asset to the site. They shared their knowledge of Norse daily activities and way of life. Inside the structures that one tends to view as primitive huts, it quickly becomes clear how little we've progressed in terms of using what Mother Nature provides to protect us from the elements. There was a warmth and coziness that blanketed all who enter. 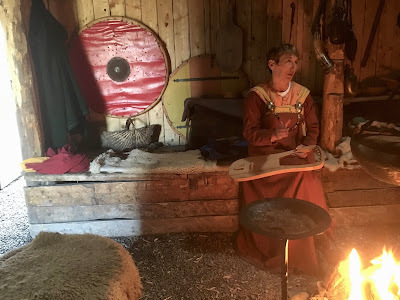 And while the wood fire has been replaced with gas the ambiance helped clarify how well equipped the Vikings were for this climate. 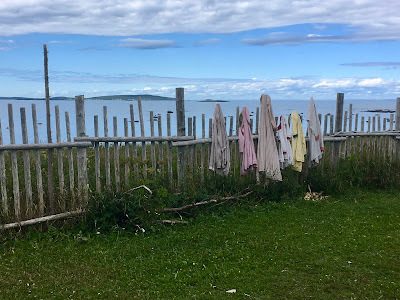 It is known that two or three women were part of the small settlement of men at L'Anse aux Meadows. 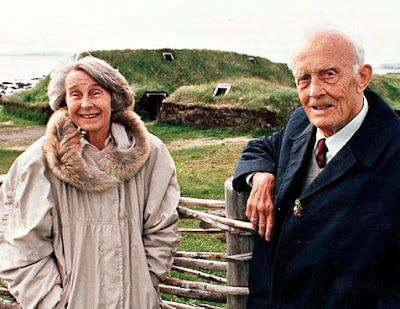 They may have been the captain's wife and perhaps that of his second in command. 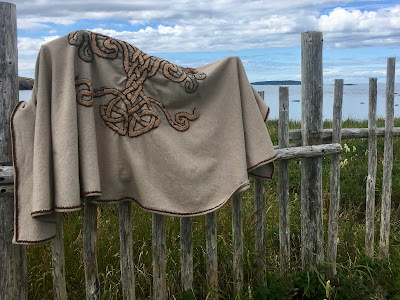 Evidence of weaving were uncovered by Ingstad and Stine. 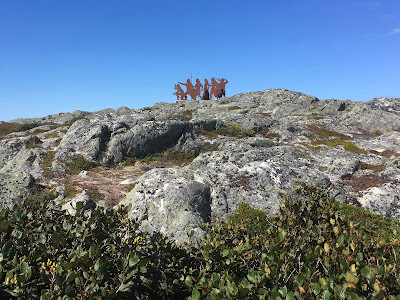 On the walk back to the parking lot we climbed the rocky hill to take a closer look at the sculpture and the surrounding area. 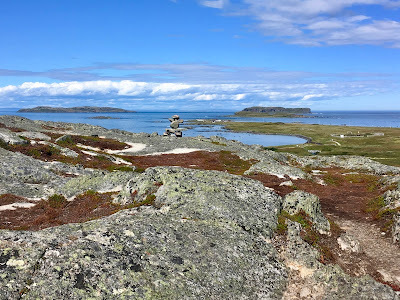 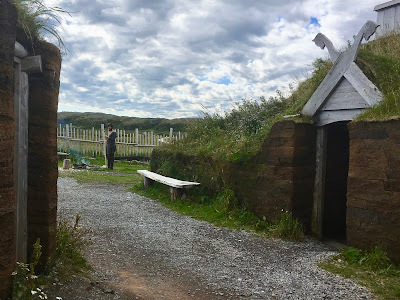 It was lovely and the Norse Settlement at L'Anse aux Meadows a highlight of our time in Newfoundland.